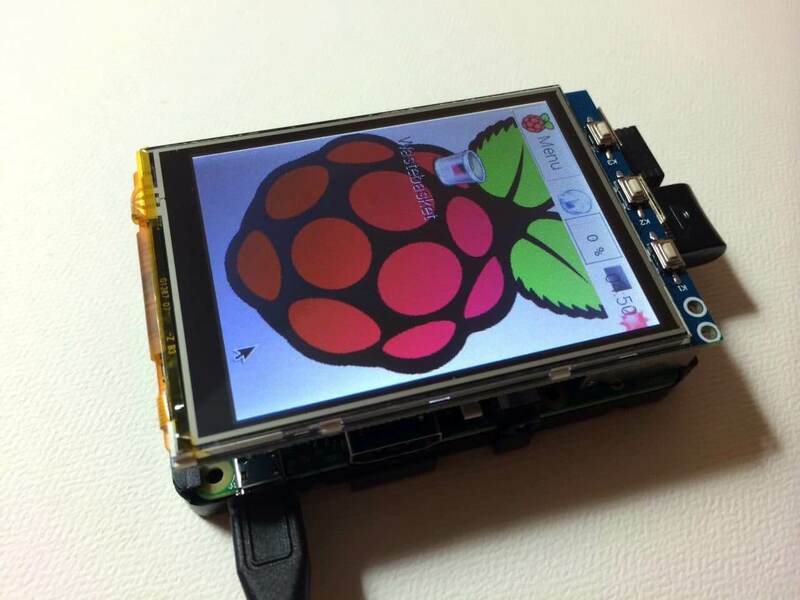 Connecting an LCD display to your Raspberry Pi is sure to take your project up a notch. They’re great for displaying sensor readings, songs or internet radio stations, and stuff from the web like tweets and stock quotes. Whatever you choose to display, LCDs are a simple and inexpensive way to do it. 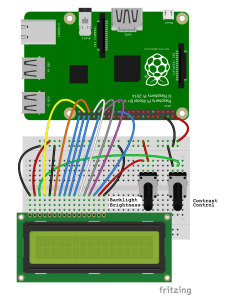 In this tutorial, I’ll show you two different ways to connect an LCD to the Raspberry Pi with the GPIO pins. The first way I’ll show you is in 8 bit mode, which uses 10 GPIO pins. Then I’ll show you how to connect it in 4 bit mode, and that uses only 6 pins. After we get the LCD hooked up I’ll show you how to program it with C, using Gordon Henderson’s WiringPi LCD library. I’ll show you how to print text to the display, clear the screen, position the text, and control the cursor. You’ll also see how to scroll text, create custom characters, print data from a sensor, and print the date, time and IP address of your Pi. I’ll be using a 16X2 LCD display here, but the examples below will work with any LCD that uses the Hitachi HD44780 driver. 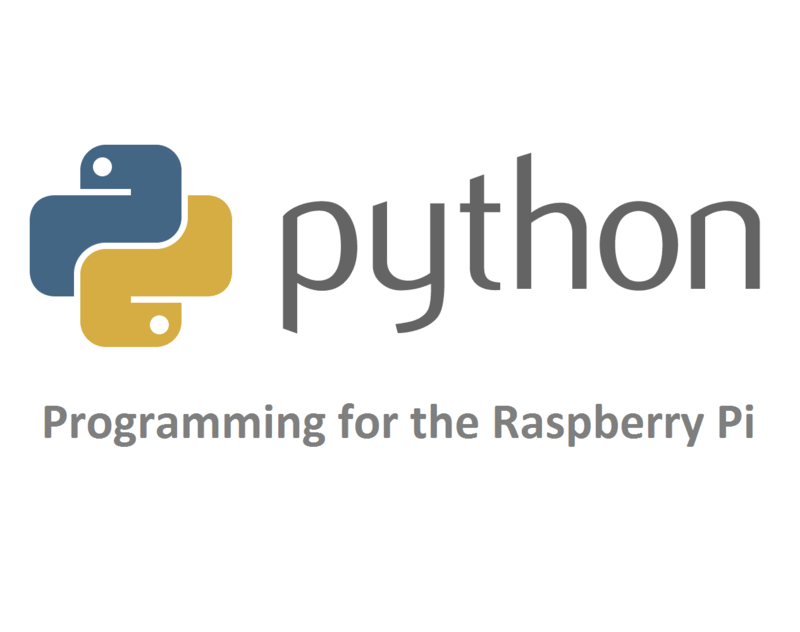 If your project uses Python, we have another article that will show you how to program the LCD in Python. There’s another way to connect your LCD that uses only two wires, called I2C. 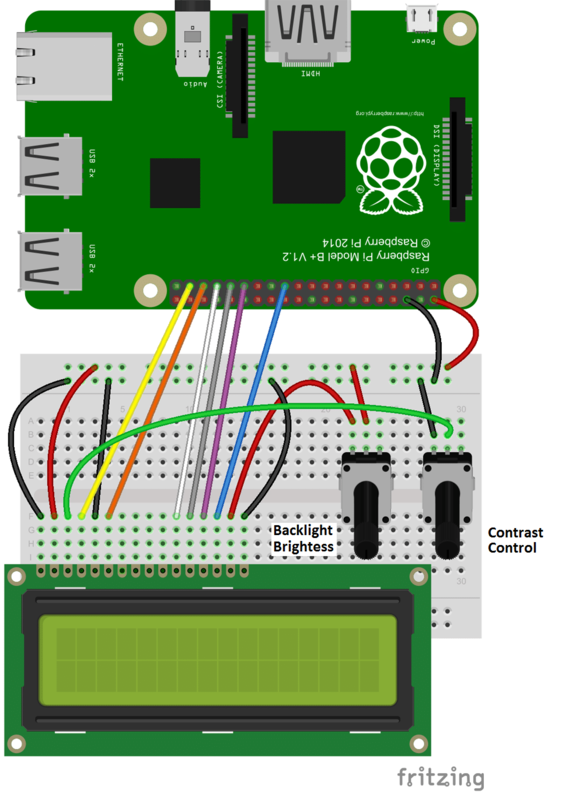 To see how to do that, check out our tutorial How to Set Up an I2C LCD on the Raspberry Pi. Most people probably want to connect their LCD in 4 bit mode since it uses less wires. But in case you’re interested, I’ll show you how to connect it in 8 bit mode as well. In 8 bit mode, each command or character is sent to the LCD as a single byte (8 bits) of data. The byte travels in parallel over 8 data wires, with each bit travelling through it’s own wire. 8 bit mode has twice the bandwidth as 4 bit mode, which in theory translates to higher data transfer speed. The main downside to 8 bit mode is that it uses up a lot of GPIO pins. The brightness and contrast potentiometers are 10K Ohm, but you can also use 1K to 3K Ohm resistors here. In 4 bit mode, each byte of data is sent to the LCD in two sets of 4 bits, one after the other, in what are known as the upper bits and lower bits. Although 8 bit mode transfers data about twice as fast as 4 bit mode, it takes a longer time for the LCD driver to process each byte than it takes to transmit the byte. So in reality, there isn’t really a noticeable difference in speed between 4 bit mode and 8 bit mode. The brightness and contrast potentiometers are 10K Ohm, but 1K to 3K Ohm resistors will work as well. 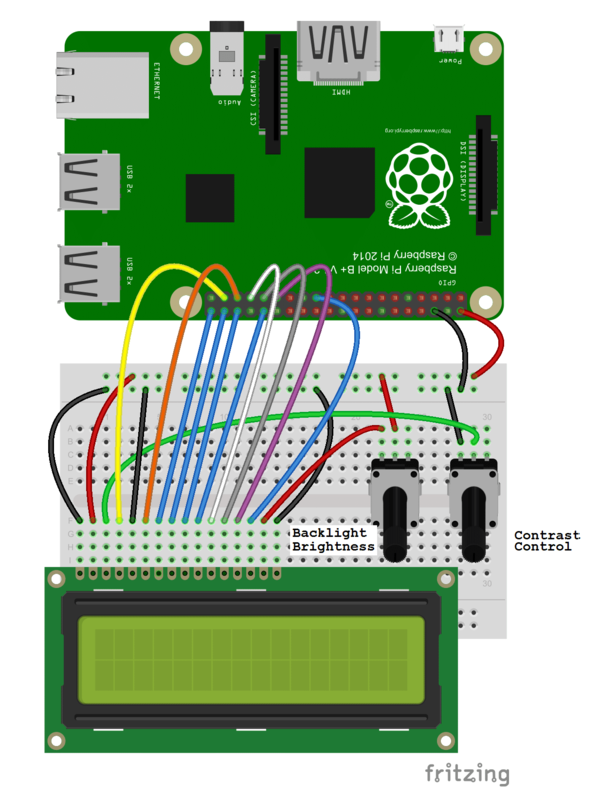 If you’ve never worked with C programs on the Raspberry Pi, you may want to read our article How to Write and Run a C Program on the Raspberry Pi first. It will explain how to write, compile, and run C programs. Note: If you get an error installing Git, run sudo apt-get update and try it again. Now we’re ready to start programming the LCD! Change example and example.c to the file name you want to use. 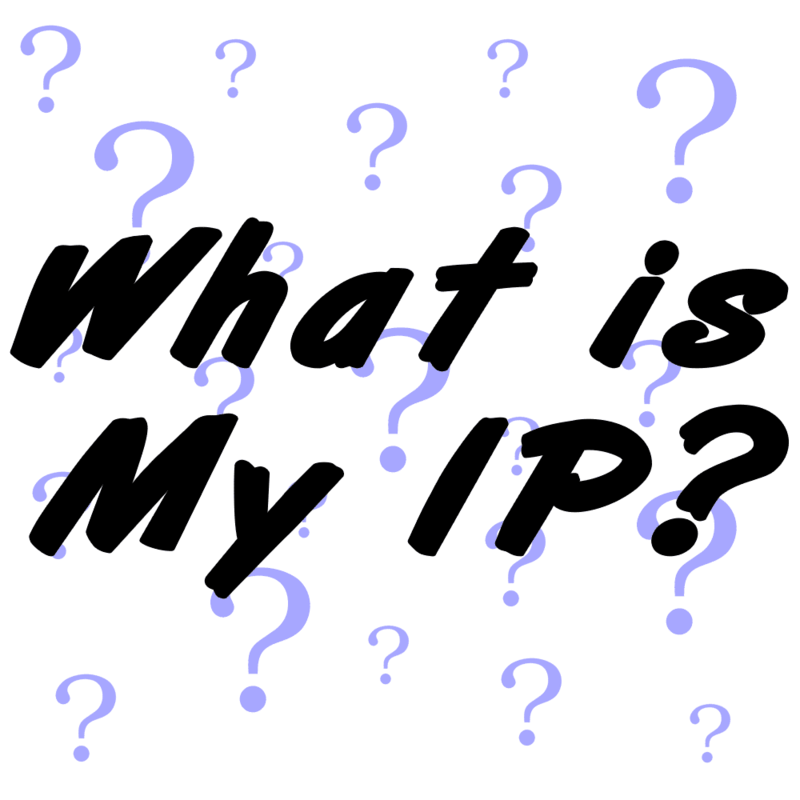 WiringPi has it’s own pin numbering system that’s different from the Broadcom (BCM) and RPi physical (BOARD) pin numbering systems. 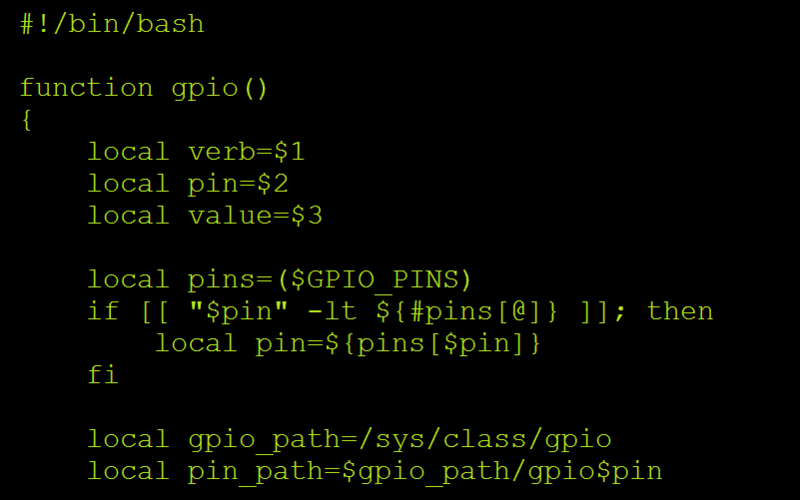 All of the programs below use the WiringPi pin numbers. To use different pins to connect the LCD, change the pin numbers defined in lines 5 to 14. You’ll need to convert the WiringPi pin numbers to the physical pin numbers of the Raspberry Pi. See here for a diagram you can use to convert between the different numbering systems. The function lcdPuts(lcd, “Hello, world!”) prints “Hello, world!” to the screen. By default, text is printed to the screen at the top row, second column. To change the position, use lcdPosition(lcd, COLUMN, ROW). On a 16×2 LCD, the rows are numbered from 0 to 1, and the columns are numbered from 0 to 15. Notice how the first string is printed to the top row, second column (the default position). Then after clearing the screen, the second string is printed to the top row, first column. Each LCD character is a 5×8 array of pixels. You can create any pattern you want and display it on the LCD as a custom character. Up to 8 custom characters can be stored in the LCD memory at a time. This website has a nice visual way to generate the bit array used to define custom characters. To print a single custom character, first define the character. For an example of this see lines 12 to 19 below. Then use the function lcdCharDef(lcd, 2, omega) to store the character in the LCD’s memory. The number 2 in this example is one of the 8 locations in the LCD’s character memory. The 8 locations are numbered 0-7. Then, print the character to the display with lcdPutchar(lcd, 2), where the number 2 is the character stored in memory location 2. 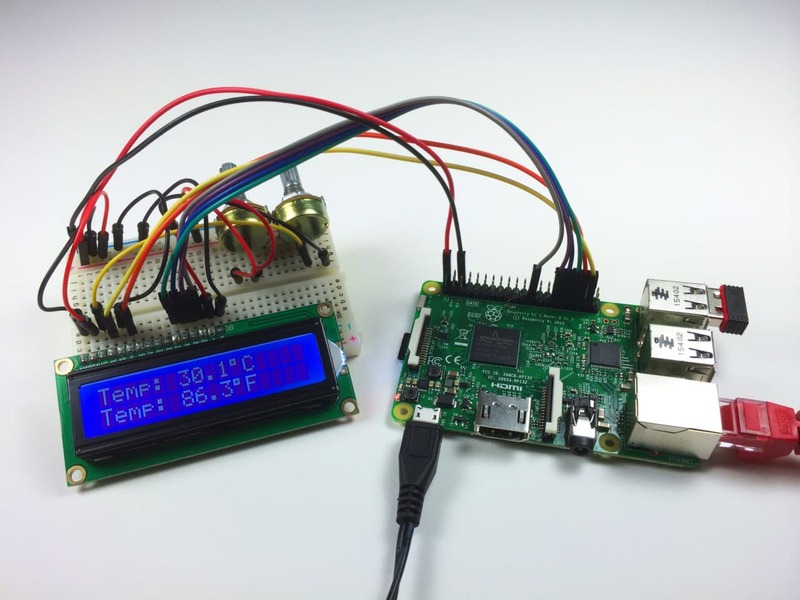 As an example to show you how to display readings from a sensor, this program prints temperature and humidity readings to the LCD using a DHT11 temperature and humidity sensor. To see how to set up the DHT11 on the Raspberry Pi, see our article How to Set Up the DHT11 Humidity Sensor on the Raspberry Pi. For temperature in Celsius, un-comment line 72, then comment out line 73. Hopefully this helped you get your LCD up and running on your Raspberry Pi. The programs above are just basic examples, so try combining them to create interesting effects and animations. If you have any problems or questions about installing the LCD or programming it, just leave a comment below. And don’t forget to subscribe to get an email when we publish new articles. Talk to you next time! Should I set display on/off, pulse and delay, function set of my LCD according to its datasheet?????? i’m thank you for this , you’re really a cool genius, i will share this ! >Hi. Thanks for great examples. Hey radoslaw did you find a way to your problem i have the same problem and i don’t know what to do!! Worked for me but some of the scripts are missing some include lines, not a big deal though. I want to make a clock display followed by cpu and ram usage after 5-10 secs. I am great at C language (not) so if there is an example then is much appreciated. i’ve followed the first tutorial using python language and it worked but then i was confused with the second tutorial using c language. i use i2c driver while the tutorial is direct using gpio pin. You saved my life man thaaaaaank you so much !!!! Great post ! Learned a lot.